Nail Of The Day: Sally Hansen Insta-Dri Fast Dry Nail Color in 'Whirwind White' And Konad! Here is my current nail of the day. It was super easy to do. 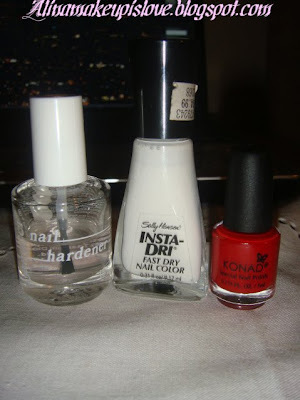 I just painted my nails with Sally Hansen's Insta-Dri nail polish in whirlwind white (2 coats), and added a Konad image from plate m65 using Konad special polish in red. I finished the look my adding a shiny top coat-brucci Nail Hardener in Clear. Disclaimer: I bought all of these products with my money, and for my personal use. I am not affiliated with any of the companies mentioned above. Love love love...I need to make it my duty to stop biting my nails and grow them, you just may be inspiration too with all these nail of the Day. You keep posting dear. I always love your nail designs!I really want to try the konad wheel. Where can I get it? wow! that looks so professionally done. Good job ALina!